Trace: This is the point when the oils and lye water are emulsified. At thin trace, there will be no streaks of oil and the soap will be the consistency of thin cake batter. As the soap sits, it will continue to thicken to medium and thick trace. This video has more information and examples of each stage. Gel phase: During gel phase, soap gets as hot as 180°F and develops a gelatinous appearance. Learn more in the Jazzed About Gel Phase post. Gelled soap has a brighter color and a slightly shiny appearance. It can also be unmolded more quickly. 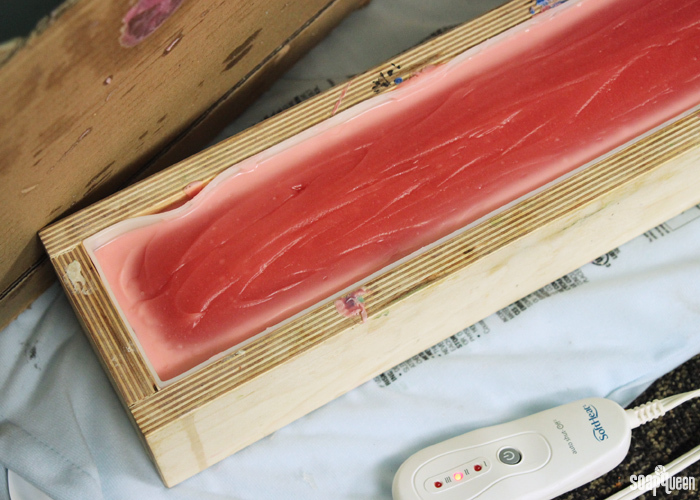 Some makers force their soap through gel phase with blankets and heating pads. However, gel phase isn’t required – it’s personal preference. It only affects the look of the bars, not the quality. Ungelled soap has a more matte appearance. You can prevent gel phase by putting soap in the freezer for 24 hours. Learn how to force it or prevent it in the When to Insulate Handmade Soap post. Curing: Technically, cold process soap is safe to use after a few days. However, we recommend letting the soap cure for 4-6 weeks in a cool, dry place with good airflow. Excess water will evaporate, which creates harder and milder bars that last longer in the shower. It’s definitely worth the wait. Lye Calculator: This tool makes formulating cold process recipes easy. All you have to do is enter the oil weight or percentage and the Lye Calculator will give you the lye and liquid amount you need for your recipe. It also calculates the superfat level. Learn how to use the Lye Calculator here. Soda ash: This creates an uneven, white, ashy film on soap. It forms when unsaponified lye reacts with naturally-occurring carbon dioxide in the air. It doesn’t affect the quality and the soap is safe to use. However, it can obscure more intricate designs or make the bars feel crumbly. You can prevent it with a few tricks, including a 10% water discount and gel phase. Learn more in the Explaining and Preventing Soda Ash post. Lye is a highly corrosive product. It’s safe to use as long as it’s handled properly. Before getting started, make sure to watch this video or read this post about lye safety. Make sure there are no kids, pets, or other distractions in the room when you’re making soap and always do so in a well-ventilated area. You’ll need the following items to work with lye. Gloves: Rubber dish gloves that go almost to the elbow work great, but they can be bulky. Thinner nitrile or latex gloves provide protection without the bulk. Whatever you choose, they should be paired with long sleeves. Goggles: Alkali burns are extremely dangerous for your eyes. Your safety goggles should protect them from all sides, so regular glasses aren’t sufficient protection. If you wear glasses, make sure to get goggles that fit over them. Long sleeves, pants, and close-toed shoes: Protect yourself from unexpected splashes by covering any exposed skin. Face mask: This is an optional step. If you’re sensitive to lye fumes or if you’re making large batches, you can wear a dust mask. Any equipment used for soapmaking should be exclusive – don’t use it for food. Lye and fragrance can get stuck in cracks, even with thorough washing. We also recommend hand washing instead of using the dishwasher. Learn more about how to clean soapmaking tools in this post. Containers: We recommend heat-safe glass, plastic, or stainless steel bowls. Don’t use aluminum – it can react with the lye and create toxic fumes. Stick/immersion blender: Using a whisk or stand mixer can take hours. 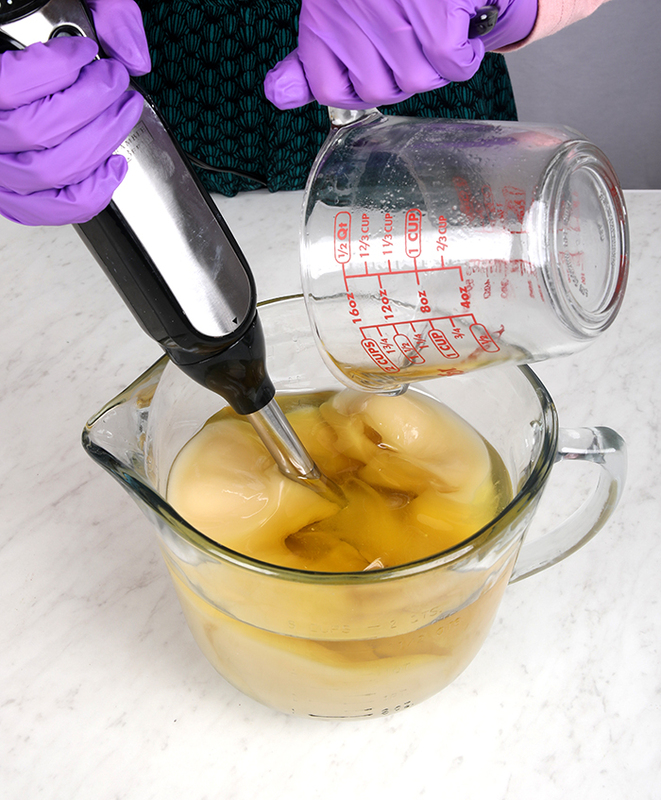 Stick blenders emulsify the soap in just a minute or two, so it’s worth the investment. Silicone spatulas and spoons: Use these to scrape every last bit of soap out of your container and into the mold. They’re also great for smoothing the top or creating texture. Scale: For accuracy, all of our soap recipes are measured by weight instead of volume. This is a good $20 starter scale. Soap molds: There are plenty of options to choose from. This post can help you decide which one is right for you. Silicone molds: These molds are easy to use, unmold, and clean. They’re a great option for beginner and advanced crafters. 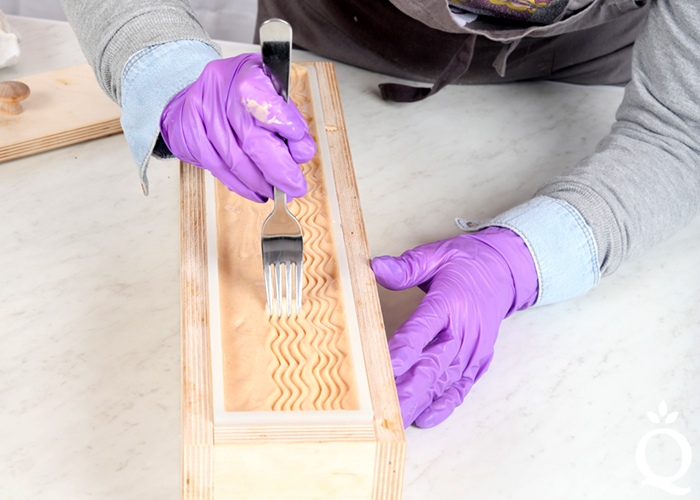 Wood molds: These are great for large batches and they make it easy to force gel phase. They need to be lined with freezer paper or a silicone liner. Plastic molds: You can use these for cold process, but they do require a few extra steps. We recommend a recipe with lots of hard oils and sodium lactate to help the bars come out cleanly and quickly. Get more tips here. I’m going to start soap making. I have doubt about the kind of sodium hydroxide. I don’t know if it is possible to use NaOH that is not from a good brand(like Merck).I dont know if it must be high grade or no. I’ve bought one that wasn’t expensive. As long as it is actual sodium hydroxide the brand doesn’t necessarily matter. You will want to check the purity though as that can affect how well the soap you make will harden. Our recipes call for a 97% pure lye so if yours is only 90% you will need to add 7% more lye in order to get the same effect we got in our recipe. I’ve just made a batch of soap. However, after weighing all the ingredients out I realised I had my scales set on fluid ounces instead of ounces. Will the soap be safe to use? That depends on the specific recipe and how much ended up being used. As long as the soap isn’t lye heavy it would be safe. Hello, I am starting making soaps and I have some questions. I do not want to use palm oil in my soaps, I made a recipe that is 40% olive oil , 30% coconut oil, 15% sunflower oil, 5% castor oil and 10% shea butter. I would like to put almond oil but I am not sure if it will be too much and the effects in the soap. Is that a good recipe to clean, give the soap lather and be gentle to skin without being oily or stick? Can I add titanium dioxide and desiccated coconut to this batch to make it a white coconut soap? I’d also like to up the coconut oil %. This is my first CP attempt so I don’t want to mess it up. Sure you can definitely do that! If you use too much Coconut Oil though it can be a little drying for the skin. I was actually trying to leave a comment under the Castille Soap tutorial but I cannot find the ‘leave a comment’ section. I have a very daft question. I want to make the castille soap and leave it in the mold for a few days to harden. However, I don’t really have molds to spare. Prepare yourself for a daft question. Can I line a study cardboard box with baking paper and use that as a mold? If i make sure there’s no gaps/leaks and the cardboard is sturdy enough to hold the soap? Yes, if your cardboard is sturdy enough without any gaps or leaks you can use that to make your castile soap. I would recommend lining it with freezer paper first. I am just starting out and I have never made cold process before. I’m so excited to try. However, I want to product a palm oil free product. Are recipes without palm oil supposed to be for the more advanced soap maker? Palm free soap recipes can be a bit tricker but they don’t necessarily have to be. If you’re just getting started I think one of the simplest palm-free recipes would be our Simple Castile Cold Process Soap which is 100% olive oil. Just keep in mind it can take some patience waiting for it to harden. Pure Olive Oil soaps tend to take longer to cure to a really hard soap so some people leave them for 6 months to a year. But you are more than welcome to use them after 4-6 weeks, they just might be a bit soft. Does that match my description – will it turn out at least somewhat like the bar I want? And Do you have any other advice on my formula? That recipe sounds perfect, the castor will definitely help the lather and you have enough hard oils and butters in there to make a pretty long lasting, harder bar. I have been soaping for a couple years. Goat milk soap is new to me though. I made some today, but the lye milk mix only got to 85 ° F. I know the cooler temps make it harder for lye to dissolve so I stirred stirred stirred. The oils (half coconut half olive) were 91 °F when I combined them. Everything traced fine and looked nice. However!!! I noticed a few fine grains in the container as I was washing up. I’m worried it’s definitly lye! Can I save this batch? What do I do? I’m sorry if this was asked before. Thank you! It looks so beautiful…. I can see some grains in the soap as it’s hardened….. definitely lye. Is it really trash? 800 g of oil, 310 g milk, 121 g of lye. If soaping cooler those could be Palm Stearic flakes (from parts of the Palm Oil cooling and hardening), not lye flakes. I would weight a couple weeks then test those spots for lye heaviness. If they are not lye heavy your soap is safe to use. If the soap *is* lye heavy it still isn’t trash. You can turn the soap into laundry soap. Hi! Thanks for the reply. I didn’t use palm oil. I only used coconut and olive oil. I guess I won’t trash it and just wait to test it. It’s definitely lye grains. I didn’t use flakes. Still savable? If it is undissolved lye flakes those spots of soap can be irritating to the skin for sure. You may want to turn it into laundry soap to be safe. Hello! I was just wondering, if we don’t cure the soap for the required time. (I’m letting it sit for a week), is it still safe to use? Most of the soap making process happens within the first 48 hours. That means after 3-4 days, your soap is ready to use! I made a soap 2 weeks back. I tried it on 15 th day just to wash my hands. It lathers but looks slimy and my hands feel sticky after washing. I used 4% castor oil and 2% Neemseed oil oil in my recipe. Will it be alright once cured for 6 weeks.? It will definitely feel a bit different after the full curing time as the soap tends to harden and feel less slimy as it sits. The longer it sits the less water in the recipe which will stop it from feeling that way. I waited 6 weeks and tried my soap. It’s awesome. No slimy feel and it’s hard. Good moisturizing lather… I love it. Thanks team for your support. I love your website. I have watched a lot of your videos and have perfected my own soaps. I especially love the safety videos that many websites are lacking including mine but I did embed your video on my site. 1- How to control the PH of the soap ? 2-after making the soap bar i fell that the soap bar still oily what ever the PH is over 9.5 so what was that? i know that there is a glycerol exist into the bar which has 14 PH so if you would know how to separate it or how to control the PH. The ideal pH for your soap is 9-11. Within the first few days of making your soap, it will have a different pH, but should mellow out. Do you mind if I ask what’s in your recipe? and i am using a cheap oils cause i do not want to lose a lot of materials. both seems pretty oily i do not know why ……? I ran your recipe through the Lye Calculator and your lye and water amounts are just fine. I’m not familiar with some of the ingredients, like Na Cl, but I have an idea about your soap! Because your soap uses mostly soft oils, it may just need longer to cure. Soft oil recipes typically take at least two months to harden and cure, so I think letting them sit out in a cool, dark place may take away some of the oiliness. I’ll include a link that explains more! and i have a question can the soap have a higher percantage of sunflower or corn oil rather than olive oil? You can use olive oil at 100% in your recipe. You can also use sunflower oil at 100% in your recipes, but it is typically used at 20% or less. As for corn oil, I’m not sure! We’ve never used that product before. You may want to make a soap that’s mostly olive oil with corn and sunflower oil at 20% or less. Keep in mind because you’re using all soft oils, your recipe will be very soft and take longer to unmold and cure. I am gathering my supplies for my first time soap making – and I would love to have a similar giant glass mixing/pouring handled container like yours pictured! Do you know where I might be able to find one similar to yours? nice work but i have a question here…..
i want to use potassium hydroxide instead of sodium hydroxide because i can not get sodium hydroxide. what would be the difference for the result soap? and about the recipe ……dose the concentration and the percent of potassium hydroxide is the same as sodium hydroxide? Potassium hydroxide is used for liquid soapmaking. When adding to bar soaps, it creates a liquidy oily mess, so I definitely wouldn’t use it in your cold process recipes. Just ordered a ton of supplies and I’m ready to really get into soaping. I made five batches a few months back and feel I have the hang of it now. One thing I had to learn was to add a little extra FO’s or Eo’s in my soap recipes. Mine smelled ok when unmolding them, but when using them, there was very little scent to them. I do like my hands to smell nice after washing them 😀 Then I learned that those amounts listed were a “recommended” amount and almost everyone I talked to used more. I was using under so going to try more next batch! Can’t wait to see how that works. Thank you for all your helpful videos! I’ve watched them all. You can add more fragrance or essential oil if you like. Keep in mind that some essential oils or fragrance oils may cause irritation if too much is used. The product description on brambleberry.com and our Fragrance Calculator is a great way to learn more about suggested usage rates! I tried to make a soap a few weeks ago with coffee on one side and fragance (spellbound woods) on the other. The recipe is from one of your books. I noticed that the half with coffee is quite hard and the part with the fragance is soft like butter on room temperature. The coffee was damp when added but no extra water was added to the recipe for compensation of adding dry matter. Can I assume the part with fragance is softer due to adding extra (flüid) oil? Thanks for your reply. According to my notes, it was made just 3 weeks ago :), it cannot be used yet. I try to learn as much of the process as possible. It is nice to compare the two parts of this soap, especially since these are made equal, but have a different finish. I would recommend giving it another couple of weeks. The side with no coffee grounds should set up more and get harder. I wonder if it is safe to use the same silicone mold for MP and CP soap making. If so, how can I clean the mold? You can absolutely use our silicone molds for both melt and pour and cold process. They’re very versatile! When used in the correct amounts, Neem Oil is safe for a wide variety of purposes and for small children. It should not be directly applied to the skin. The same applies to essential oils. If used in the correct rates, they will be perfectly safe 🙂 They should never be applied directly to the skin. If you have any more questions, let me know! Hello, am wanting to try my hand at soap making..Have been looking at several different sites, recipes..etc..lots of reading, studying..whewww!…lol..one thing I have noticed on recipes is that total ingredient % s are not equaling 100%..I am confused by this..could you please explain. I am wanting to use a simple recipe of coconut oil, olive oil and coco butter, but would like to use coconut milk in place of water. Is this a workable idea? Thank you for any help and suggestions..
That’s awesome that you have been doing your homework! There is a lot to learn when it comes to cold process :). Regarding the oils not adding up to 100%, could you tell me a little bit more about the recipe? The percentages of oils should add up to 100, and then the water and lye is calculated based on your oils :). When making your first batch of cold process, I would recommend using water instead of using a different liquid, like coconut milk or goat milk. Working with milk can be very tricky, because when the lye is introduced to milk, the milk scorches. If you’d like to learn more about making soap with milk, you may find the blog post below helpful! I read somewhere that you shouldn’t use glass for soap making because the lye will etch it and compromise the integrity. But I see you use large pyrex measuring cups. Have you had issues with this or is it only an issue if you don’t use a heat safe glass? I’m just getting ready to start my soap making journey and I’m still doing all my research and gathering my supplies. Thanks. We have never had any problems using glass containers when making cold process soap. I would highly recommend Pyrex glass, we have found it to be very sturdy and reliable 🙂 You may find our Tool Kit for Beginner’s helpful! If you have more questions, don’t hesitate to ask! Lye does etch glass, but it takes a while. Lye and lye solutions should be stored in plastic, not glass. I am working with kids and soap making. I need ideas for making molds with the kids. Several resources have suggested clay but not what type. There is limited time so it can not be too complicated. All suggestions for molding materials are appreciated. If you’re interested in making molds, you may find our Flexy Fast Molding Putty a good options! It allows you to use any object to create a silicone mold. It does take about 24 hours for the putty to set up. I hope this helps! Hi, i am new to soaping, I’ve only made 2 batches so far and loved it. I have a question, what is the shelf life for cold process soaps? How do i know when they expire and are not safe to use? Good question. The neat thing about soap is that it never really “goes bad.” The pH level of soap does not allow for mold or bacteria to grow. That being said, after a while the soap will start to dry out, become crumbly, and the fragrance and colors will fade. This usually starts to happen within 6 months or so, depending on how the soap is stored. I hope this helps! Could you let me know if handmade soaps can be used for small kids (3 year old). Is it safe for kids too? Do we need to take care to use any special ingredients/oils when preparing soaps for kids? I prepared soap with following ingredient – shea butter, olive oil, coconut oil, palm oil. Can this recipe be used for small kids? Handmade soap is perfectly safe for children as well as adults :). There are no ingredients that you absolutely have to use when making soap for children, but you may want to design your recipe to be very gentle and hydrating. One of my favorite recipes for young children (and for myself!) is the Baby Bastille Soap which uses Coconut Oil, Olive Oil and Buttermilk to create a very hydrating, gentle bar of soap. I got our book for Christmas and decided to make a soap today. It was all going ok but I decided to double the dose to fit in my mould but I forgot to double the lay and water. The soap looks beautiful but I don’t think it will works . What should I do to make it work? Hi, I was wondering can a soap that’s been placed in the refrigerator overnight to prevent gel phase, go thru gel phase once it’s been taken out of the fridge? I think that happened to my soap also I noticed that it started to develop soda ash even though I spray alcohol on it. Good question! If your soap is going to go through gel phase, it will do so as it is setting up. After it has set, it will not go through gel phase. So if you left your soap in the fridge and it did not gel, it would not start going through gel phase after it has been removed. It’s normal for soda ash to form even if your soap did not go through gel phase. Although spraying alcohol on the soap will help prevent soda ash, it’s possible for some to still develop. Soda ash depends on lots of different factors including the temperature of your oils and the amount of water in your recipe. For more information regarding soda ash, you may find this blog post helpful! Thanks, I mistook the color change thinking it was starting to gel, I had never had that happened before so it seemed really strange. You’re so welcome :). If you ever have questions, we are happy to help! I made my 1st batch yesterday. The recipe is just simple 150 gr of coconut oil (29 C), 350 gr rice bran oil with 6% superfat (165 gr water, 67.5 gr lye). I mixed the lye solution and oil at around 118 F (for both solution). Because I’m using the spinning whisk (whisk that will spin on itself manually when I push the handle down) not stick blender I though it would take sometimes to reach trace, but to my surprise it actually quite quick, maybe within 1-2 minutes. And I’m not spinning the whisk continually too, just in short burst mixed with manual stirring. The trace was quite thick, like yogurt, so I put it in my container straight away (no FO or color or any addition) and insulate it with tea towel and put it aside. I check it from time to time and quite exited when I see it enter the gel stage in the middle. After 8-9 hours, I remove the insulation because the temperature had gone down to room temp. Also, I deliberately left a bit of raw soap yesterday to mixed with around 20-30% sea salt and just a little splash of lavender FO (I did the addition by feel) just to see what’s the difference and checking if my Lavender FO is compatible for soap making or not. I put it inside an individual mold and just cover the top with tissue. No insulation. After around 3 hours, I unmold the salt bar and cut it into 2 to see the inside. It was a bit soft and I saw some salt clump but otherwise it looked normal. The color is uniform which is good, no streaking. Tissue get wet when it touches the soap but I guess after curing it won’t be a problem. Is the u-shape white streaks dangerous? This is for personal use so if it’s just a cosmetic problem, I am actually quite ok with it. Do you know why this happened? I’m planning to make another batch of soap, so if I did something wrong, I would like to avoid it later. Help and thank you in advance. Thanks for all this great information, the picture was really helpful! 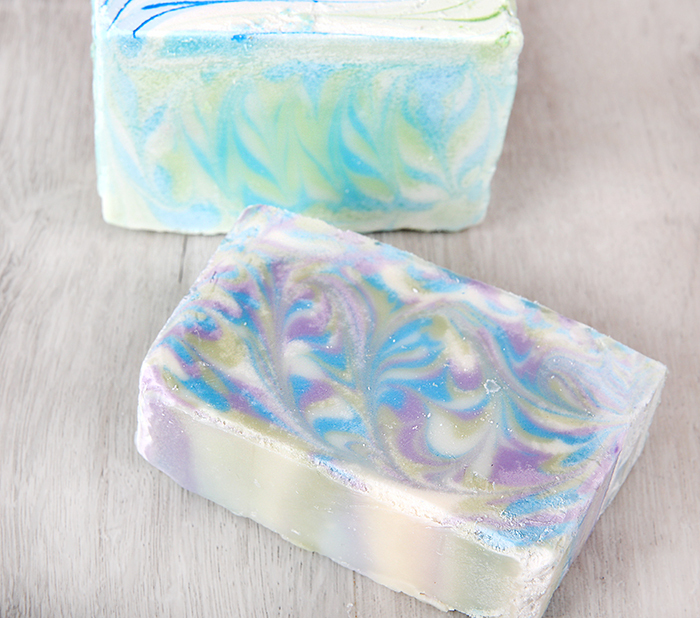 The white streaks in the soap are fine, your soap should be perfectly safe to use :). My best guess is that effect is heat related. Next time I would try not insulating your soap and see if that helps! I’m guessing that the streaks are due to the gel phase. Thank you so much for the reply. It’s great that my 1st attempt does not end up bad :). I’m planning on making castile soap next, just trying to figure out where to get the olive oil first. I heard that big brand like Bertolli was involve in the fake olive oil scandal a few year ago, that’s makes me sad and mad at the same time. Been buying that brand for a while for cooking, it was so expensive too. Have they fixed the problem? It’s hard to find local olive oil here (Indonesia) and I can only find those big brand olive oil in supermarket. There’s people selling them online saying they imported the stuff and have certification, but I’ve been burned before buying things in the internet. So I guess I’m just being very cautious. I might just do that. I have cousin in America, I’ll order when they’re coming here to visit to cut the shipping cost :). I guess the castile soap project has to be postponed. I was thinking about doing salt bar for my 2nd soap now. I saw you salt bar recipe here: http://www.soapqueen.com/bath-and-body-tutorials/cold-process-soap/pretty-in-pink-salty-cold-process/. I want to modify it a bit by using 100% coconut oil, honey for the extra moisturizing effect and earl grey tea in it. Can I ask is it okay to use honey in salt bar? I tried looking for salt bar recipe using sugar in it but I couldn’t find it so I was wondering if it’s not possible for a reason. I added melted beeswax at light trace and it solidified! I got lumps in my soap. I used a natural beeswax which I shaved off. What can be done to avoid this in future? Working with beeswax can be tricky for this exact reason! I recommend adding the beeswax into your liquid oils, and heat the mixture until the Beeswax has melted entirely. Melting the Beeswax in the oils facilitates even distribution of heat for optimum melting. This oil wax mixture will be very hot, so be careful!you’ll need to keep your oils above 170 degrees and work quickly to prevent the mixture from clumping. You may find these cold process recipes using beeswax helpful! Sorry if this has been asked, but does anyone include the amount of fragrance oil into their “total oils” calculation? Good question! You do not need to include your fragrance oils into your total oil calculation. You will base the amount of fragrance oil on how much soap you are making. For example, we recommend .7 ounces of fragrance oil per pound of cold process, and .5 ounces fragrance oil per pound of melt and pour. For more info on how to calculate fragrance oil usage, you may find this blog post helpful! This post explains how to use out handy-dandy fragrance calculator, which you can find at the link below! I’m new to soap making and its fun. 1 question. If i want to make a 3.5 1bs soap without using the size of a mold, just oils. How do i calculate the oils and water? This is a tool that allows you to select what type of soap you’re making, add the amount of oils by percentage or weight, and will calculate the amount of water and lye you need, as well as giving you your yield. Hi. I’ve wanted to try making my own soap but I wonder if I can make it with only coconut oil or even virgin coconut oil. My only source for olive oil is the supermarket and it’s a bit pricey. Thanks. You can make soap using only coconut oil! 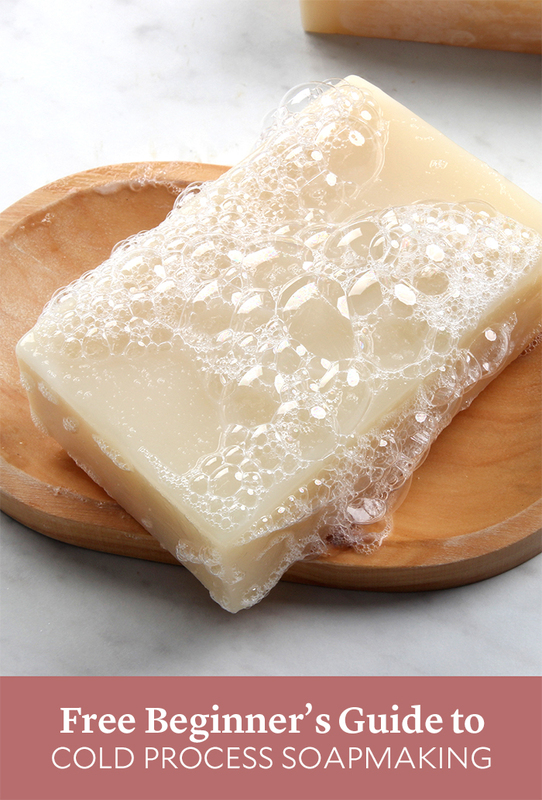 We actually have a great blog post about making coconut oil soap! oh thanks so much for sharing!! I have a dilemma with gel or not gel. I like my soaps creamy look. I would prefer do not gel. I have been soaping in low temp. but then I was getting my soap with soda ash. But then I get soda ash on the top of my soaps. I have read if I cover my soap and insulate and spray with alcohol I can avoid soda ash I just start to make bigger batch of soaps and I have found partial gel in my soaps. Can I let my soap without insulating at all, soaping between 85-88 F. and avoid the soda ash? How? Please Help! Wether or not you choose to gel your soaps is totally up to you. We often gel our soaps because it not only helps prevent soda ash, but results in brighter colors. You’re correct, spraying your soap with alcohol and covering can help prevent soda ash. My suggestion would be to slightly soap hotter by about 10 degrees. If you tend to soap at cooler temperatures, achieve a thicker trace before pouring to lessen soda ash formation. If soda ash does appear on your soap, you can steam it off or simply clean your soap using cold water and a paper towel. when browsing through net, i happend to check that aluminum should not be used for soap making. Am using a blender which has stainless steel blade, but the shaft (the umberlla which covers the blade) is “polished aluminum”. am using this for my preparation. could you kindly guide me if its safe to use?. I made quite a few batches of soap with this, and have used them too..but happend to get bit concerned about this and thereby wanted to check with you. Are the batches of soap which i prepared safe to use? can i continue using this blender? When making soap and working with lye, you want to avoid aluminum because lye reacts with aluminum. We have always found our stick blenders to work really well! I would contact the manufacturer of your blender to make sure it’s safe to use with lye. The soap that you already made is fine :). Thanks for the quick reply. I shall change my blender and buy a new one which is completely stainless steel. I do not see any discoloration in the soap batches which i had already prepared, using my old blender. Can i use those soaps? Is it safe to use? I would double check your soaps using the zap-test. A zap test is sticking your tongue on the soap to test for a “zap” or lye reaction. It will be a zap like sticking your tongue on a 9 volt battery! This would mean your soap is lye heavy. I’m sure your soap isn’t lye heavy, but I would double check to make sure! I have some vegetable glycerin soap that now has a white substance on it. This was a store purchased soap that someone gave me as a gift. I left it in the plastic container and now it has this white substance on it. Any idea what it is? Is the soap ok or do I have to toss it? Any help would be appreciated. Thanks. My white substance looks more like a white powder. I’m wondering if there was sweating and then it dried and turned white? When I wet it, it doesn’t come off. If I rub it with my dry finger when the soap is dry, some of the white is on my finger. I just thought you might know what it was and an easy way to get it off. By the way, the soap was in the shape of a snow globe. There is liquid inside and a plastic figure. The liquid inside is pretty low. Maybe that was seeping through the soap? Do you have a little more info about this, or maybe a photo? We would love to hear from you at info(at)brambleberry(dot)com. The more we know, the more we can help! Thanks Paula! I got to a hard trace VERY quickly. When I mixed in the fragrance oils (1 oz), the soap seems to curdle. I kept on mixing, and the soap got harder and harder, and it got very difficult to put in the molds (silicone. I ended up spooning and trying to mush it in there). While sitting in the molds, the soap has started to “melt” into a kind of crumbly goo, and it’s very hot to the touch. I’m pretty sure I mixed the lye completely, and the oils were at around 128 degrees and the lye-water mixture was at around 134-135 when I combined them. So where did I go wrong? And is there a way to salvage this batch if it doesn’t settle down after cooling? I’m new at soap making and so far have made one 2lb batch of simple CP soap. I would like to add some charcoal to it. What is the rule of thumb as far as amounts go for this ingredient or any other dry ingredient like ground oatmeal or dried camomile flowers for instance? Should they be added after trace? Should I separate some of the traced mixture and add the amount I need and then add it to the rest of the batch or should it be added to the oils before mixing with the lye mixture? Thanks for your help and love your videos. I can tell that you are a very patient lady. We are so excited that you have started soaping and can’t wait to hear more about your soapy adventures. Typically, dried ingredients like powders and botanicals can be added in at trace. It is totally up to you how much of your botanical you add into your soap, but we suggest starting at a rate of 1 tablespoon per pound of soap (oils/butters + lye + water) to get started. With the colorants (like the Activated Charcoal), you would add about 1 teaspoon per pound of soap to start out with and then experiment to find a usage rate that works for the rest for you! If you are finding that your colorants are clumping, we suggest adding them to a bit of fixed oil (like Sweet Almond Oil) beforehand and mixing the colorant in and then adding it to your batch at trace. I just made my first soap and am very happy but I noticed I added my oils to the lye and not the other way around. Will this soap be safe to use. We are so excited that you have made your first batch and can’t wait to hear how it turns out for you. We always suggest adding your lye water to the oils for safety reasons, but your soap should be just fine. If you want to double-check after it has hardened, we suggest doing the zap test. The zap test is where you lick the soap after it has hardened like a 9-volt battery. If it zaps, your soap is lye-heavy and you won’t be able to use it on the skin (it’ll be good for laundry soap! ), if it doesn’t zap, you can use it! You’ve helped me with some M&P questions and I am now confident enough to tackle CP. I’m ready to start the process but was just told by a(different) supplier that the plastic “Milky Way” molds that I used for M&P would not tolerate the higher temperatures of CP soap. Is this true? I have ordered a slab mold and can wait until it’s delivered, but I’m ready and raring to go now! Thank you, once again. I really appreciate having a trusted source to go to for questions. Is there a good rule of thumb to estimate how much your finished soap will weigh? I mean after it has finished curing. I have read anywhere from 20-25%, but it does seem that could vary greatly depending on the specific ingredients used, and possibly even where you live. I think the weighing before and after curing method will be my best bet. Hello, I have question about colorants. I am trying out oxides to color my soap. I used a red and I guess I used too much because the suds are red. Do I have to trash the batch? What can be negative issues for soap with too much colorants and colored suds. I imagine it would be fun for kids to have colored suds, but will it stain things(skin, tub, sink, clothes ect?) Also, so this does not happen again, how do I know how much to use in he future? I premixed it 1/4 tsp to 1 oz oil like I read somewhere. Any help would be wonderful. The amount of colorant you use actually depends on what kind of soap you are making and the colorant you are using. For an easy guide reference, here is a post that Anne-Marie wrote a few years ago that I use every time I am soaping. Thank you so much for the quick response! I will check those out! I’m wondering what I can use to replace the coconut oil in the soap. My friend who is helping me with this is severely allergic, so I’m just wondering what would make for a nice alternative? as You mentioned that soap may tend to “cling” to silicone mold a bit longer, I wonder is it possible that soap also cling to silicone mold if I leave it there few days longer (too long)? Once I left it in silicone mold for 2 days and it was impossible to get it out in one piece. Did I fail patience test? It seems to me that too short and too long curing in silicone mold is bad. In reference to one of your earlier comments, I am using a large slab mould with my CP recipe and I want to ensure I force gelling all the way through. Previously I got a partial gel. This is a large mould (8lb)and I have used a heated blanket and still only got about a 75% gel. I left the heated blanket switched on all night on a low setting to help -but still a partial gel. Any tips? After a lot of experimenting with CP and CPOP, I’ve decided I like to let the soap go through gel phase. I don’t want to do CPOP any longer, and I don’t like soaping at room temperature. When I soap at 125-130degrees, I’ve never had a problem getting a thorough gel by insulating CP. My question, and it may be a silly one, is what’s the lowest temp that will still go through gel phase? I’ve tried soaping and room temp, and didn’t like it too much. P.S. I was able to do a bit of research on the question that you asked and I have an answer. You can soap as low as you would like, but 80 degrees Fahrenheit is as low as we would recommend going as Coconut Oil (which is in most recipes), hardens at 76 F.
If you are soaping at lower temperatures and do want to go through gel phase, you will need something to help ‘jump-start’ the process. We suggest insulating with a towel and applying heat through a heating blanket. But, if you are soaping at low temperatures, even putting a heating blanket on it will not guarantee gel phase. We suggest soaping around 120-130, insulating and even adding a heating blanket on low if you want your cold process batches to go through gel phase. I’m interested in getting a full fask mask to use while making cold-process soap? What ones do they use at Brambleberry? Just made my first cold process soap! What does it mean if your soap thickens after you’ve blended and added fragrance oil? Mine seemed to almost solidify, I was able to pour it as one sort of gelatinous glop. Definitely not the pudding like trace I thought I had reached! Thanks for any advice. Congrats on your very first cold process soap, isn’t it so much fun!! =) Sometimes certain fragrance oils can actually accelerate trace so that your soap get super thick. I’d love to help you troubleshoot what happened, which scent did you use in your batch? I used ocean rain, about 1.7 ounces for a 2 pound batch. I used the soap recipe that comes with your beginners cold process kit. I took it out of the mold and cut the soap down yesterday, it seems fine. I wondered about the fragrance oil too, as it seemed at the appropriate trace stage right before I added the fragrance. Thanks for your help, looking forward to my next batch! I don’t remember exactly how long, maybe somewhere between 1-2 minutes. It didn’t seem that long! I will try to shorten that some next time and see if that makes a difference. Thanks for your help! I would try pulsing your stick blender instead of a full-on blend to see if that would help for your 1-2 minutes. I would also suggest checking out this blog post that takes about trace and emulsion, there are some great tips in it! Thanks! I made a batch today and it worked out much better! Pulsing helped, and after adding fragrance it seemed to reach an ideal consistency. Looking forward to checking it out tomorrow! Thanks for your help! Hello. I plan on making cp soap and I will be using silicone loaf molds because that’s what I have on hand. I have read in books that molds need to be insulated with towels or blankets. Do I need to insulate my silicone molds? Also, later when I’m able to buy or make wooden molds, do I need to insulate them also. Thank you for your response. Thanks for responding. I’ll take your advice and I will send you a picture! what is lye? from where i can get that? With all the information out there about the effects of palm oil, I’m wondering why most soap making recipes still contain this ingredient? There is no such thing as sustainable palm oil as is claimed by suppliers and it’s not traceable and it won’t be until at least 2020. Is it because they are old recipes and no one wants to take the time to recalulate them using a different oil? It seems so unethical to keep promoting this product when there has to be other options. I am still super confused about the percentages. What is this a percentage of?? A percentage of the total weight of oils? How do I know the total weight of oil? HELP!! And why is it done in percentages, anyway? Why not just weight or volume? I’d be happy to help you out! We give the percentages so this recipe can be adapted for any size mold — think of them as ratios! So let’s say you are making soap in our 5 lb. wood log mold. You would go to our lye calculator and under where it asks “Are You Measuring in Grams or Oz (or Just Percentage) of Oils?” choose “percentage.” Now you can enter in all your percentages. Then it will ask you how much the oils will weigh in the finished product. Generally our rule of thumb is the oils will weigh 30% less than the total yield. So if the total yield of the soap is 80 oz. (remember we’re using a 5 lb mold, and 5 lbs is roughly 80 oz. ), then 30% less of that would be about 56 oz. Here is the math I did so you know exactly where these numbers are coming from — (80 x .3 = 24) and (80-24 = 56). So my question is – how necessary is all of this measurement precison? Would my soap making be greatly improved by purchasing a digital scale? Personally, I would love a recipe as follows: a cup of this, a tablespoon of that, and a pinch of the other thing. Wouldn’t that be great? Hello fellow soap makers! I’ve been making cold process soap for many years and ocassionally enjoy “getting back to basics” by reading tutorials. This is a good one. One of the things that I’ve noticed changing over the years is the insistance on precise measurements. When I learned to make soap no one I knew was using digital scales – measurements and temperatures were not precise. I have experimented with many combinations of oils, temperatures, additives and scents; most of my soaps have been great for gifting or bartering and some have been suitable only for home use. A few have been somewhat disasterous, but at the end of the day I always made … soap. It might not always be beautiful but it cleans you in the shower. Now I see recipes that call for very precise measurements, like 2.31 ounces of lye. Really? I don’t own a digital scale – I still use an old kitchen scale I’ve for 20 years. Do you think that plastic is a safe utensil to work with lye? I would think that dangerous gases from the plastic would be brought out and eventually end up in our soap. Thank you for your very informative site. I would like to make soap without palm oil as I think it is an industry I do not want to support, but most recipes seem to contain it. Do you have a suggestion for a substitute? Thank you in advance. If you don’t want to use Palm Oil in your recipes, you can always use something like Rice Bran Oil as a substitution or add a bit of Sodium Lactate to help harden up your bars. If you do change the recipe, you will want to make sure you run your recipe through the lye calculator again so that your oils saponify correctly. Hi – I’m sort of in the same boat, I do not want to use Palm oil, soybean oil or animal fat. Very hard to find recipes that do not have palm oil so thank you for posting. I recently bought some soap and bath bombs from another soaper and I discovered I really do not like the smell of fragrance oil at all, but I love LUSH so I’m wondering if they use EO instead of fragrance oil? I spent a small fortune and I hate all of it, makes it smell cheap like a scented waxy crayon or something. I’m wondering if all fragrance oil smells yucky or maybe she uses a poor brand or something? It’s an expensive lesson, but at least I didn’t go ordering a bunch of fragrance I wouldn’t want in my own products, maybe EO is the better way to go for me. If you aren’t using Palm Oil in your soap, here are some great Palm Oil, Soybean Oil and Animal Fat-free cold process recipe that you can try out. If you are looking for the ingredients in our Melt and Pour bases, you can find them on each individual product page. Bizim Erimesi ve dökün üsleri maddeler arıyorsanız, size her ürün sayfasında bulabilirsiniz. Talk It Out Tuesday: Colorants: http://www.soapqueen.com/bath-and-body-tutorials/tips-and-tricks/talk-it-out-tuesday-colorants. If you are using our fragrance or essential oils, you can always use the Fragrance Calculator to figure out how much to use in your soap batch. Your recipe looks great and sounds like a super lovely bar of soap. What fragrance did you use? Sometimes your soap can come out dark if you use a fragrance that discolors. I have never made soap and want to start making CP process for my family as well as try to sell at a farmers market this summer. I have found the ingredients I want to use but how do I know how much of each. I haven’t found a reciepe that uses all of these, Olive Oil,Soy oil, Palm Oil, Coconut oil, Palm Kernel, Castor oil,Shea butter, and oatmeal. Oh and Lye of coarse. Sandy…if you have a smartphone, you can download a handy lye calculator. Brambleberry has one on their website. I’d go with a 5% superfat on the Lather, 7% on the Moisture. Oatmeal – I’d grind it up and add it in at thin trace but not very much – maybe 1 tsp per pound of soap, total. I have been making M&P soap for about 2 years now. I have been wanting to make CP soap for some time, but have been kind of overwhelmed at the idea of it. I have done my research (thanks to your resources!!) and am ready to go. Well, I have gathered all the tools of the trade and am almost sitting here looking at them. My head is swimming with information. I think I am just going to have to jump in with both feet. I will let you know how it goes! Welcome to the soaping party! You are going to absolutely love it! Welcome! =) We have a Facebook page too with lots of amazing interaction between soapers: facebook.com/brambleberry Would love to see you showing off your photos when you make your first batch. so, it is also okay if i use olive pomace oil instead of olive oil isn’t it? I cannot use castor oil because it’s quite hard to find this oil in my city. If i just use olive oil (or olive pomace oil) and coconut oil and palm oil, how many percentage of each oil should i use that will create a good hard bar of soap with a lot of lather but also moisturizing? That’s such a great question. You can always leave out the Sweet Almond Oil out of this recipe. And I’d suggest upping the Olive Oil by 5% and the Palm Oil by 5% to make sure you get a good hard bar of soap (Palm Oil) and also have a great lather and moisturizing properties (Olive Oil). Just make sure to run your recipe through the lye calculator so that you can get the correct amounts. Hi! It seems the link to the pdf is broken. 🙁 Just thought you should know. The lye is measured by weight and the distilled water by volume, is that correct? I think I’m close to info overload and in all the research I’ve done I think I’ve just about confused myself! Yes it helps very much. Thank you. Awwe thank you! Its fun, I don’t know why I was so scared of it for so long. I have pets and small children so I thin k that’s why I was nervous to try but my loving husband gave up his “mancave” and let me convert it Into a soap cave after Christmas so now that I have a separate workspace I decided it was time to try! I’m also fascinated by this chemical process that takes place! Thanks for the help and amazing customer service. If you are calculating the lye for your soap recipes, we highly suggest you create your recipe beforehand and when you have access to the internet so you can use a lye calculator. If you don’t have an exact amount, then your soap could be lye heavy or not have enough lye in it. What a helpful, tidy checklist/tutorial for beginning soapmakers! I started making CP soap about two years ago and something like this would have been very handy when I was a beginner. I remember feeling overwhelmed with information when I was new to soaping, and your tutorial simplifies things and boils everything down to the basics. Thanks for putting this together and sharing it, Anne-Marie! Thank you Anne-Marie, I have been gearing up to start soapmaking in 2013. I made a promise (to myself) to finish a few projects first and then I can get my supplies. Thank you so much for the information sheet. I’m really looking forward to it. I plan on taking a week and just making a few plain batches of soap to get familiar with the process. I can’t wait. Thank you so much for this, Anne-Marie! I already bought your CP soap-making DVD and have several books on the topic but since I’ve not yet mustered the nerve to do it yet, I appreciate any extra info I can get my hands on. Wishing you and your lovely family a very Merry Christmas! Thank you so much for your order, Teresa! 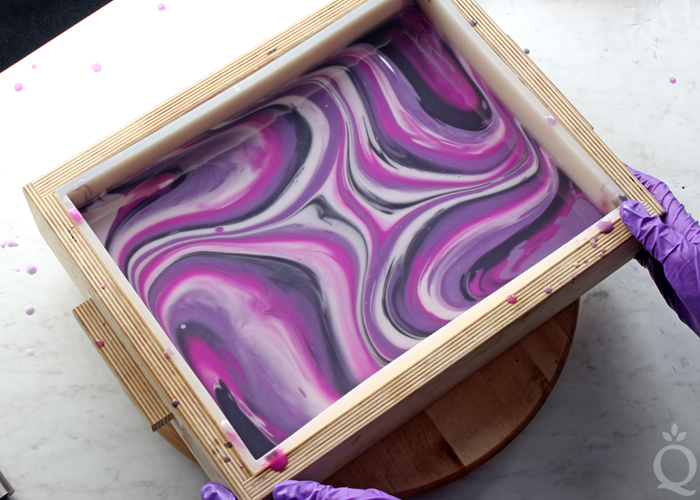 We can’t wait for you to get into cold process soapmaking.In the meantime, if you haven’t watched the Soap Queen TV episodes on Cold Process soapmaking, I’d suggest giving them a go. They are so super helpful, and I often find myself referring back to them. And here are a few cold process-related blog posts that can give you some extra tips and hints to get you ready to soap and answer some of those lingering questions. I have 1 question: how do you prevent gel phase or ensure that it gels? I haven’t been able to figure it out… Better yet, if I can’t or don’t want to do OP then how do I make sure that my soap thoroughly gels & not just in the middle of the loaf? Thanks! If you don’t want your soap to gel, the best way to prevent that, would be to soap at lower temperatures and not to insulate your soap or mold. On the other hand, most soapers do like gelling their soap and it is pretty easy to get it to go through your entire loaf. When we want to force gel in our soap, we get a heating blanket and set it on low, and set the soap mold on top of that for 3-4 hours. Make sure you are covering it with a piece of cardboard and insulate it with a towel for extra bit of insulation. I’ve seen recipes like this but instead of sweet almond oil it is with castor. What does the sweet almond do? Sweet Almond oil produces a low lather and adds moisturizing properties. Castor Oil creates a rich creamy later and attracts moisture to the skin. They are a bit of the same but you will get more later with the Castor. I’m still learning at this too but this is what I’ve learned. Am I missing something here? I see measurements for the oils, which come up to 100% but I see no measurements at all for the lye or water. How much lye and water would be used for this? Those are just percentages for whichever mold you use. You have to figure out your mold size and then figure out your oils and then run it through a lye calc. I am having the same problem. But I get the whole 100% thing. But what I don’t get is the lye calc asks what will the oild in the final product weigh? So if I want to make a 5 pound bar what should the oil weight be? What a great question. Because oils are going to weigh and saponify differently, your oil weight and amount is always going to be a little different in each recipe. 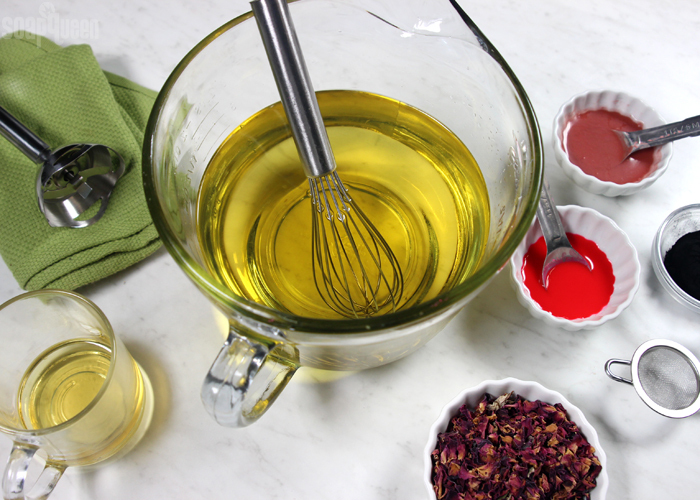 In any cold process recipe, your final weight is always going to be oils + lye + water. For example, with the recipe from this (http://www.soapqueen.com/bath-and-body-tutorials/cold-process-soap/crisp-anjou-pear-embed-tutorial/) 5 lb. recipe the oil weight is going to be 55.20 ounces, while the oil weight from this (http://www.soapqueen.com/bath-and-body-tutorials/cold-process-soap/three-color-mantra-swirl/) 5 lb. recipe is going to be 61.70 ounces. So in every recipe, the oil weight is going to change.